Do I have a treat for you for this month’s Secret Recipe Club!! 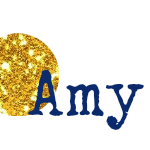 But before I get to the yumminess, let me tell you about the blog! Let’s get back to those cupcakes, shall we? I chose S’more Cupcakes because they just scream summer!! I just love S’mores! I have even made (and shared) a s’mores cupcake in the past, but that one was made from pre-made or boxed ingredients. This one is 100% from scratch! Even the marshmallow topping! If you’re going to take the time to make a s’mores cupcake, take the time to make it from scratch – you won’t regret it! Thank you, Shelley, for this amazing recipe! Mix together the graham cracker crumbs, sugar and melted butter until well combined (I used my mini food processor to crush the crackers and to combine the ingredients). Place about 1 tablespoon of the mixture into each cupcake liner. Use the back of a spoon to press the graham cracker mixture to the bottom of the liner. Bake for 5 minutes and cool slightly while preparing the cupcakes. To make the cupcakes, place the cocoa powder, sugar, flour, baking powder, baking soda, and salt into the bowl of a stand mixer. Mix on low to combine. Add in the melted butter, milk, egg, and vanilla. Mix on medium for about 2 minutes to combine. Add in the hot coffee and beat to combine. The batter will be very thin. Divide the batter evenly among the prepared cupcake liners (note: only fill the liners ¾ full, I had some excess batter). Bake in the preheated oven for 25 minutes or until a toothpick inserted into the center comes out clean. Move to wire racks and cool completely. To make the ganache, place the half and half and chocolate chips into a small saucepan over medium-low heat. Cook, stirring frequently, until the chocolate chips are melted and the mixture is glossy in appearance. Cool slightly, then dip the tops of each cupcake into the ganache to coat. Set aside until the ganache is hardened. To make the mashmallows/marshmallow topping, place ½ cup of water into the bowl of a stand mixer. Sprinkle the gelatine over the water. Place a candy thermometer into the mixture and cook, without stirring until it reaches 240 degrees F or soft ball stage (note: each stovetop is different, I need to be very aggressive with heat on my stovetop and cook my candy at medium-high to high heat. Do whatever works best for your stovetop.) Immediately remove the saucepan from the heat. Just before the candy reaches 240 degrees F, turn the stand mixer (with the gelatine mixture) to low speed. Once the candy reaches 240 degrees, immediately pour it into the gelatine mixture in the stand mixer. Immediately load the marshmallow into a piping bag fitted with a large piping tip (I used an Ateco 849) and pipe the marshmallow onto the cupcakes. If desired, sprinkle the cupcakes with additional graham cracker crumbs and/or lightly toast the marshmallow with a torch. We LOVE s'mores! These look fantastic. Thanks for sharing with the SRC. You are right, this does say summer!! Great choice for SRC. Oh, yay! I am so glad you chose these, and even MORE glad that you enjoyed them! They look absolutely outstanding - totally makes me want to make them again!! :) And thanks for the nice words!! WOW! I need these - I mean umm my kids need these. Oh wow they look so good! I made smores bars this weekend for a party but think I need to make these for our next party! Great SRC choice! My mouth is watering here!! Your Smores Cupcakes look fabulous! Thanks for sharing this recipe, it is a great choice for the SRC! Stopping by from Group D to say that these look FANTASTIC. Absolutely perfect for the summer season. YUM - great pick! 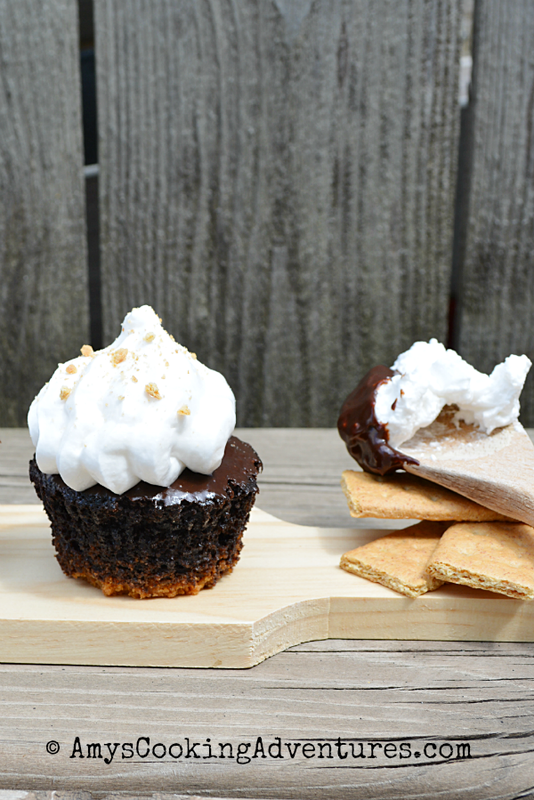 I've been wanting a recipe for s'more cupcakes! Looks like I came to the right place! Great SRC choice!! Yayyy! 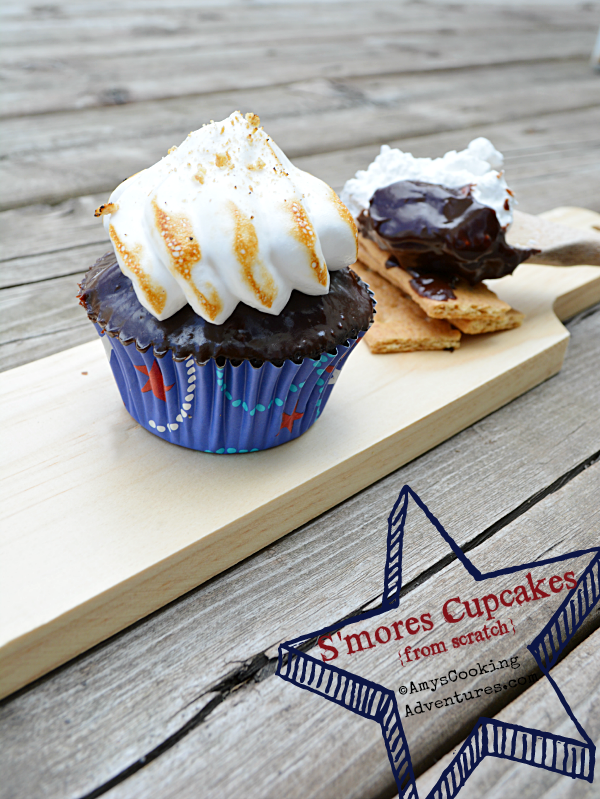 LOVE these s'mores cupcakes! total winners! Gah! Smore's are amazing and must be consumed in any form. These look amazing. Can't wait to try! YUM! These look totally amazing...so delicious! I love smore's cupcakes. Great SRC choice!